I played with my son yesterday, and this gave me inspiration for an impromptu photo session. I recently hosted a Low Key photography themed Photo & Coffee meeting for people in my photography network, Fototräff i Göteborg (Photography meetup in Gothenburg). Low Key photography was still on my mind. Set the camera on manual, and the ISO to the lowest possible setting. Set the flash to manual, and reduced the strength to its minimum setting. I put a speed grid on the flash to eliminate light spill. You can use a snoot, or an empty Pringles tube. I put the action figure on the edge of a table. I took the shot with the flash above the figure, and angled downwards. The camera was angled slightly up. This creates dramatic shadows, and makes the figure look quite large. 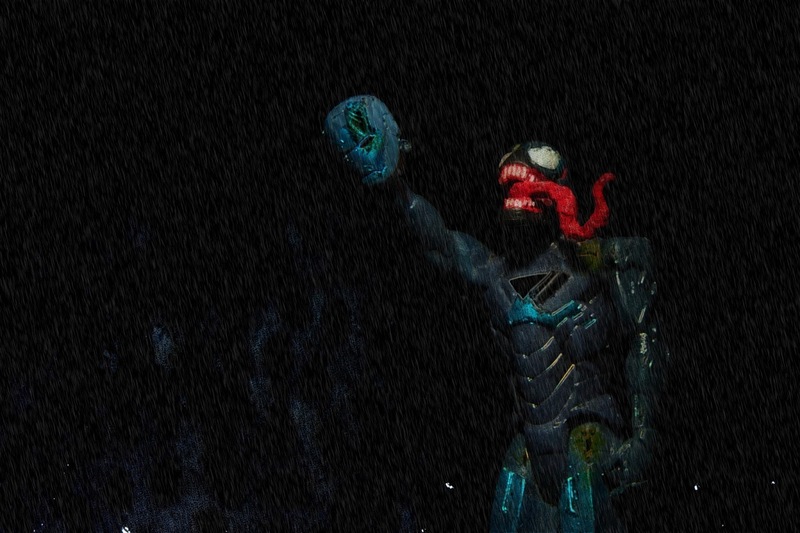 Fairly good for an improvised shot of a toy, but the look is too shiny and plastic. Enter Pixelmator, my favorite image editor. At first, I thought I'd just do a quickie, and add some rain, so I created a new black layer and used Pixelmator's rain generator. 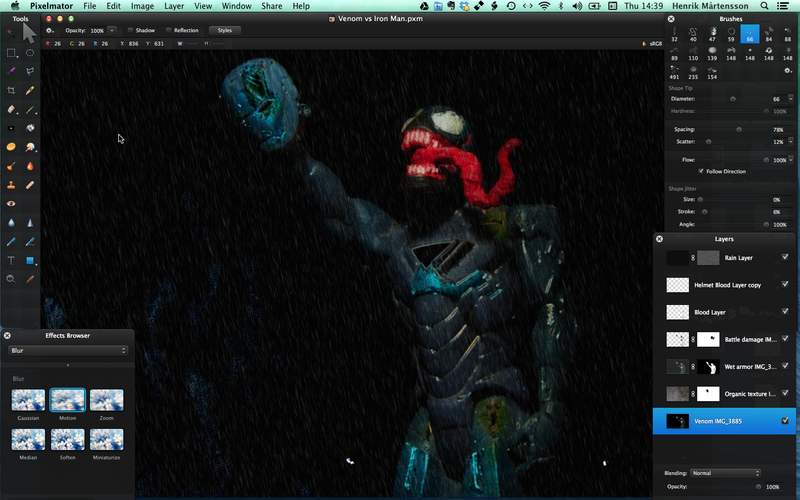 I then selected the rain, created a mask that left only the raindrops visible, and changed the blend mode to screen. The catfish skin looked pretty good on the tongue, but even better on the armor, so I decided to keep it. I used a mask to erase it from the Iron Man helmet though. Next, I selected all the brightest parts of the image, copied them to a new layer, added a tiny bit of Gaussian Blur, did something I don't quite remember (sorry about that), and changed the blend mode to Luminosity. This turned the highlights into gaping black holes. Perfect battle damage. I used a soft brush with about 10-20% opacity to touch up the picture, mostly by painting on the various masks to hide or display parts of the original photo. I created a layer for the blood, selected a deep red color, and used two spatter brushes from Pixelmator's Abstract brush set to paint blood around the gashes on the helmet and armor. I changed the blood layer blend mode to Darken. The best blend mode to use for blood can be different on different photos. The blood looked a bit thin on the helmet, so I copied the blood layer, and erased all blood except the blood on the helmet on the copy. That gave me a bit stronger coloring on the helmet. The armor looked a bit dry, so I copied it to a new layer, changed the blend mode to Overlay, and reduced the opacity to about 56%. That gave me a pretty cool look. Best of all, my son liked it!